The theme for the high key image above was ‘Senses’ but with a difference..... by eliminating the sense of sight, the other senses including the sense of touch, smell and taste are greatly intensified. The model is drawn to the strawberries by the strong aroma of the fruit, in turn the sense of touch and smell are greatly heightened and eventually the sense of taste .The atmosphere of the image is surreal with dreamlike fantasy.....hence the title ‘Touch but don’t Look’ Thank you to Jenny George our lovely model. The Senses image was shot on 35ml film but once shot not wanting to waste the set, we decided to shoot the digital shots with a slightly different approach. 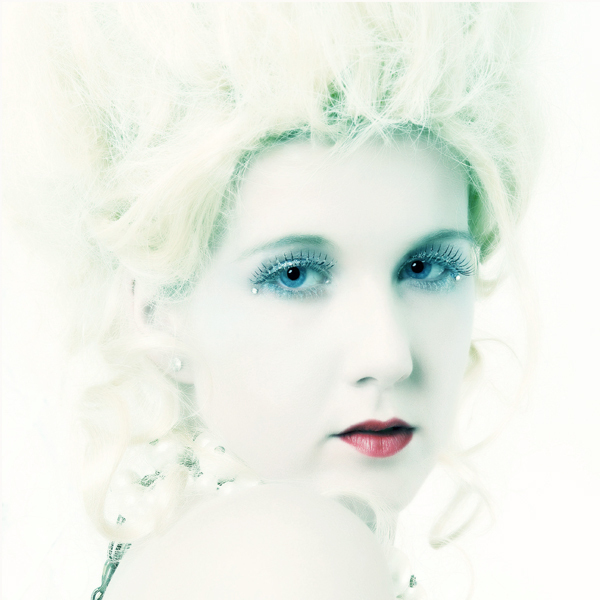 The blindfold was removed and the makeup tweaked with a much lighter skin tone so our model looked more like an Ice Queen with the emphasis on dramatic eyes and lips. A very slight turquoise blue hue was applied in post production giving a surreal elegance.